New College biology students are participating in a worldwide research project that could eventually help protect the planet against threats such as global warming and rising sea levels. And they’re using an inexpensive and novel tool to gather data about the global carbon cycle: tea bags. 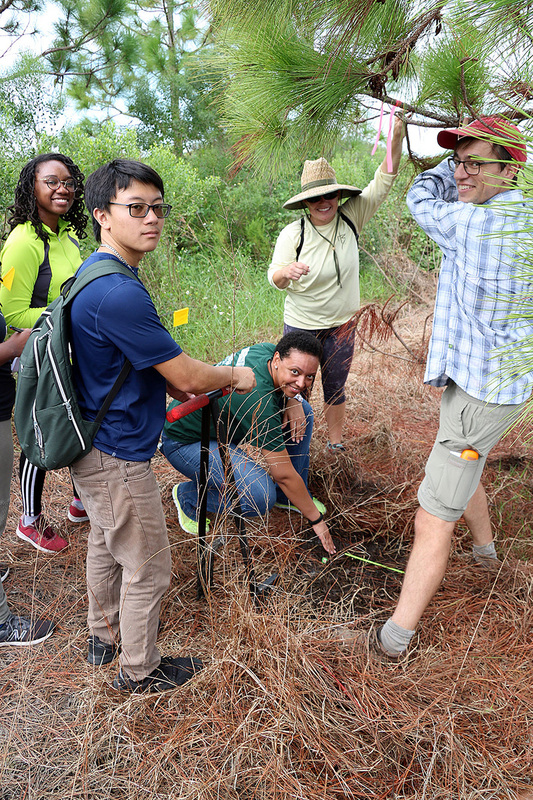 Nineteen students from the Forest Ecology Lab class, taught by Assistant Professor Brad Oberle, recently traveled to several ecological restoration sites in Manatee County, including Robinson Preserve, Perico Preserve and G.T Bray Park. Biology professor Brad Oberle, right, works with New College students at Robinson Preserve in Manatee County. Once there, Oberle said they surveyed the area, to determine, “what kinds of plants are there, how wet to soil is, and other features of the local landscape, and those are the features our students were measuring.” They also collected soil samples. “We were looking at the moisture content, the density of the soil, and we measured exactly how much carbon the soil is giving off, using an instrument we have here on campus,” he said. They then “planted” tea bags in various places, where they will sit in the ground for the next three months. The project, called the Tea Bag Index (www.teatime4science.org), began at the University of Utrecht, in The Netherlands, in 2010, where researchers came up with a cheap and easy method to measure the decay rate of plant material. The process is simple: Using specific teas (only Lipton green tea or Rooibos tea can be used), weigh each tea bag, bury them 8 centimeters deep, 15 centimeters apart, and leave them for 90 days. Dig them up, weigh them again and submit the findings at the researchers’ website. He added his class’ research is being done in former agricultural areas. “Agricultural soils tend to lose carbon. When tractors go in and harvest all the plants, they take all the carbon with them, so the carbon doesn’t make its way back into the soil; it doesn’t get stored there. Besides the tea bag research, Oberle’s class is busy with several other projects. They’ll be taking an inventory of mangrove trees in the campus’ uplands preserve, as well as documenting every tree species growing on campus. The class will use the information with the goal of applying by the end of the semester to have the New College campus recognized as an arboretum. “We have a very busy schedule,” Oberle said.